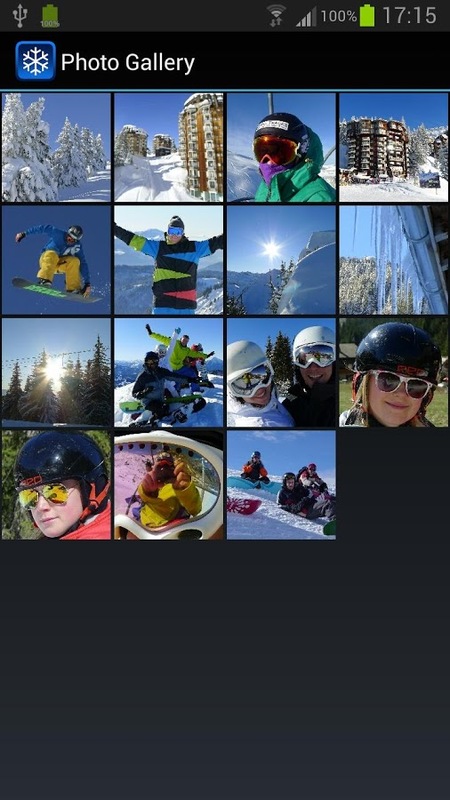 The worlds most popular Ski and Snowboard application, now available on Android. 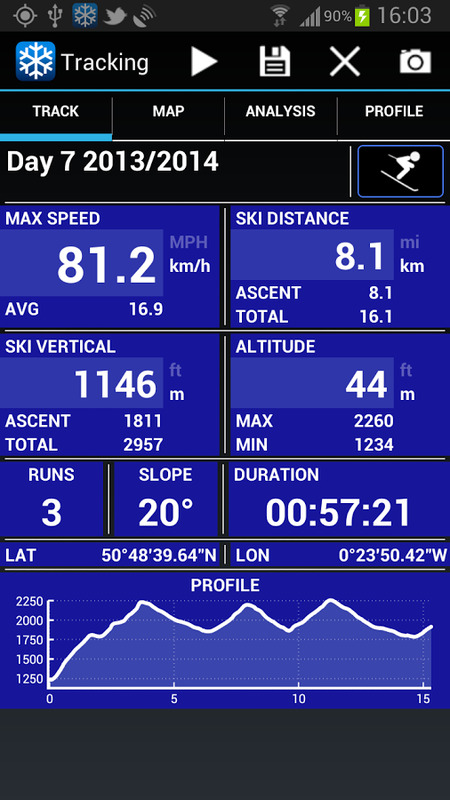 Take your Android phone up on the slopes this season with our professional and most downloaded tracking application on the market. Just press the record' button, put your phone in your pocket and away you go. 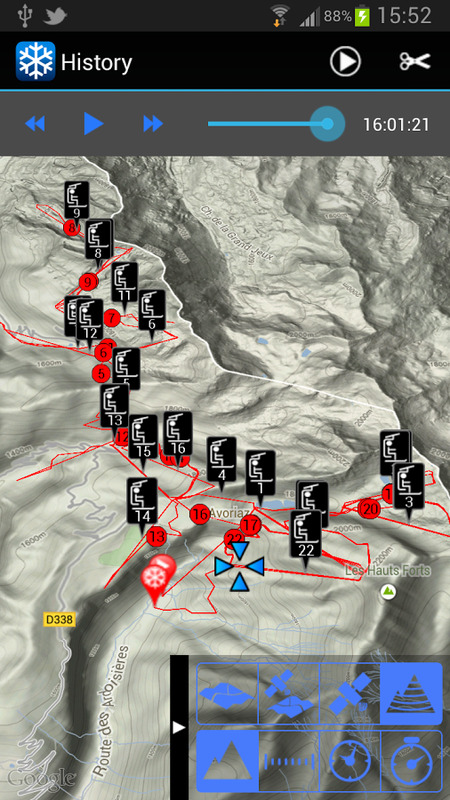 Ski Tracks will record your day, distances and track your runs. • Battery Friendly with Battery Monitor - Records up to 20 hours. • Tracks without the need for a cellular data or phone signal. • Take/receive calls and text while tracking. 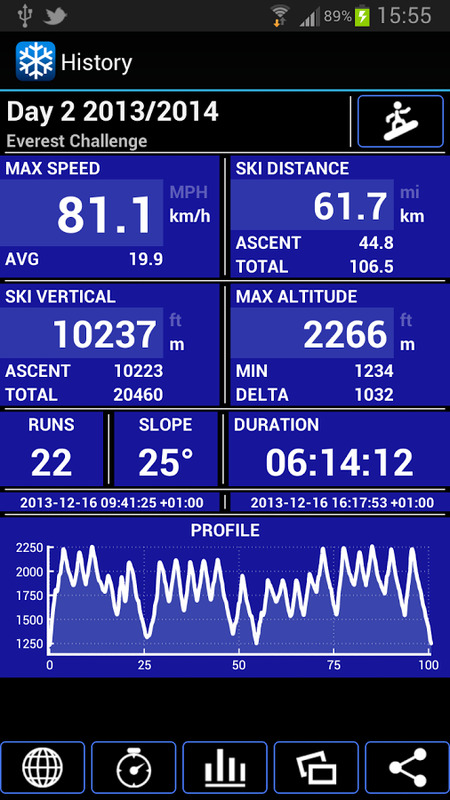 • Comprehensive Ski Stats and Profile Graphs. • Maps with Roadmap, Hybrid, Satellite and Terrain modes. • Maps Tools showing distance, time and stop watch. • Trim your day, taking off unwanted car journeys using the Map Playback and Trim features. • Add photographs to track. • Metric(km/h) and Statute(mph) units. 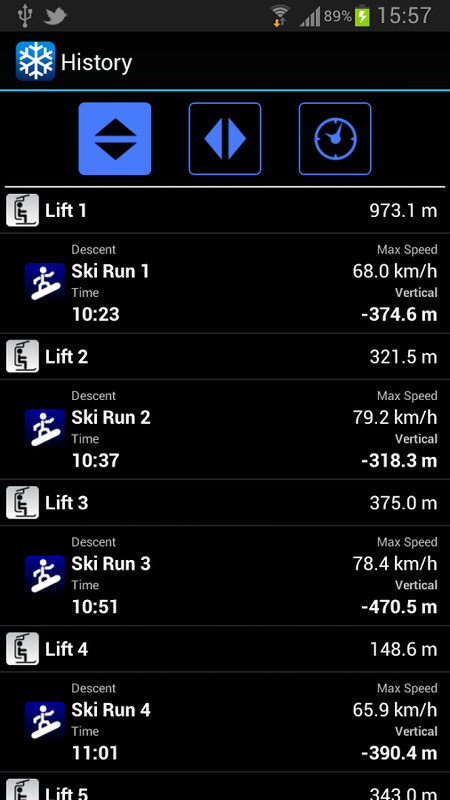 • Analyse individual Ski Runs and lifts. • Share your day on Facebook or in Google Earth. 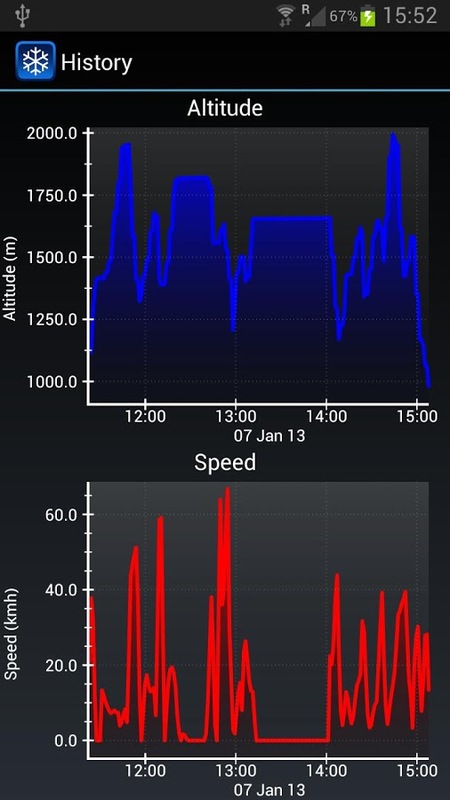 Unlike many other tracking applications Ski Tracks is designed to use less power and will last all day (1). Ski Tracks also includes a battery monitor - stopping tracking if your battery level gets too low - which reduces the possibility of a dead phone at the end of the day. Ski Tracks can run with your phone locked. It can also be paused and resumed at any time. Ski Tracks uses special algorithms designed for mountain users to accurately calculate your speed, slope angle and ski vertical. Want to check your last run maximum speed or duration or even your last ascent, then use the Run-by-Run analysis tool and Ski Tracks will break your day up into runs and lifts. Why not share your Ski Day along with your photographs on Facebook? Or even email a file that will preview your entire day in 3D on Google Earth™. 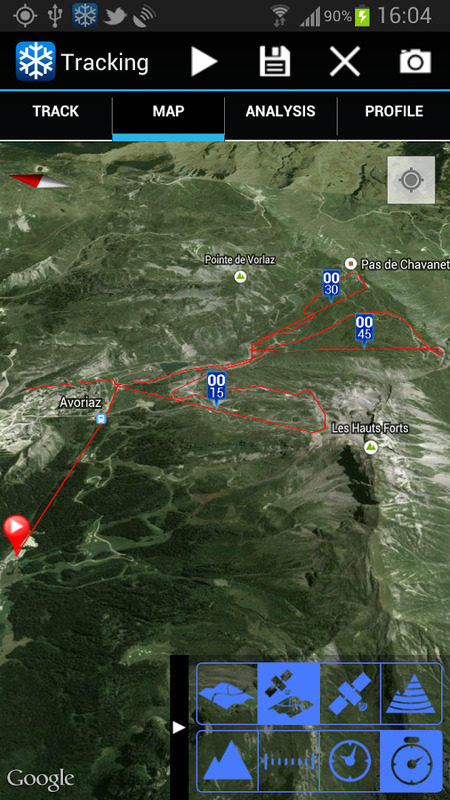 Ski Tracks uses Google Maps™ to display your track, start, finish and photographs in four different views: standard, satellite, hybrid and terrain. Visualise your day by overlaying analysis tools so you can see where you were at a specific time, see where different runs and lifts are or just to see where you were for each mile. Also you can now replay your day using the Map Playback feature. Take photographs and they are automatically geo-tagged to your Track. Note 1. Actual recording length dependant on battery condition, temperature, other background applications and phone usage. Note 2. Ski Tracks does not need data or a phone signal to record your day, the location system on your Phone may from time to time use data for location fixes, we have no control over this. THEREFORE WE STRONGLY RECOMMEND SETTING DATA ROAMING OFF IF YOU ARE USING YOUR PHONE ABROAD. As with all GPS receivers the quality of GPS signal can vary depending on the amount of visible sky, satellite positions, foliage, weather conditions etc. GPS will not reliably work indoors. For more information please checkout and download the User Guide from our web site. For more further information please check out the Support URL.